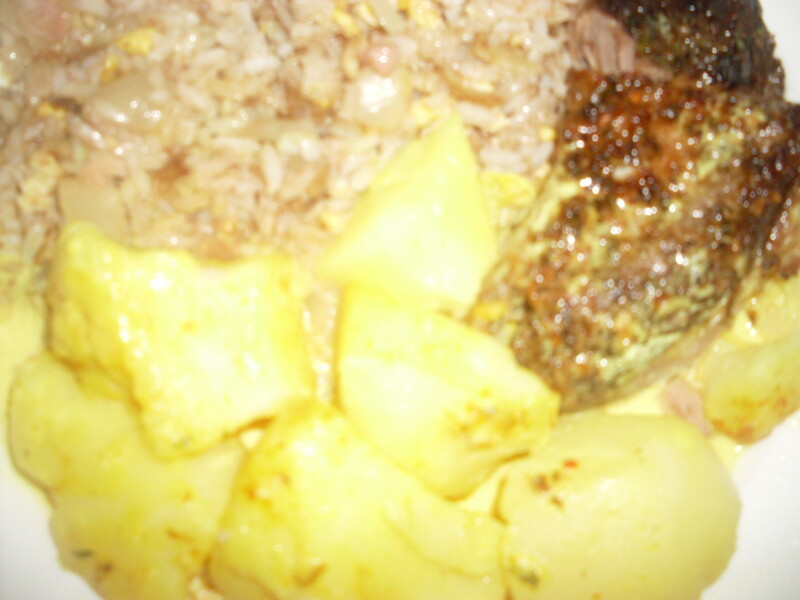 This oven roasted lamb with slow cooked curried potatoes and fried rice is a very filling and savory dinner. Do you like to eat lamb? 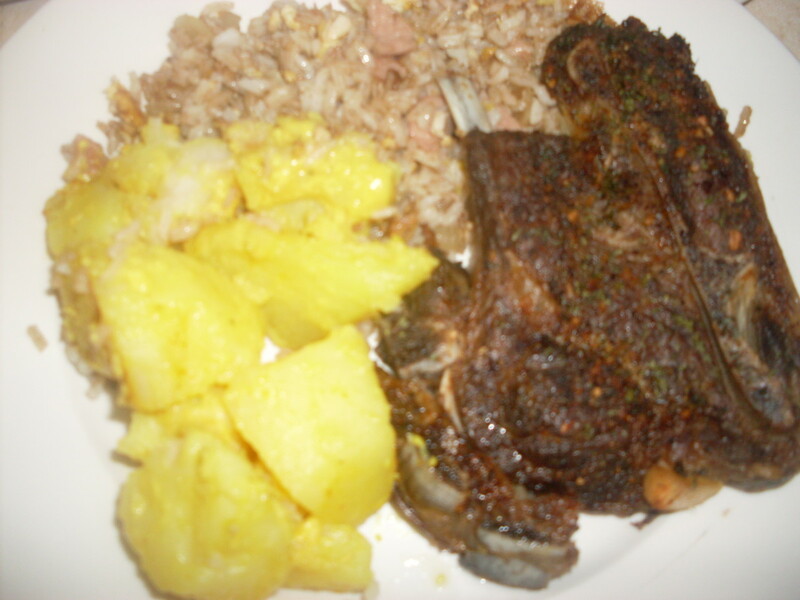 Then you will love to eat this lamb with curried potatoes and fried rice dish. 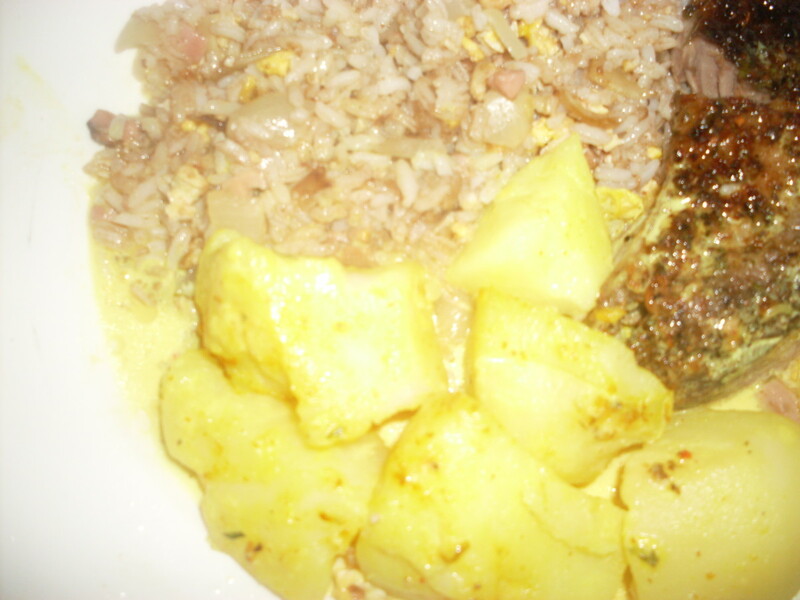 For this lamb with curried potatoes and fried rice dish, I cook the lamb meat in the oven, the potatoes in the slow cooker and the fried rice on the stove top. This dinner entrée containing the three items, lamb, curried potatoes and fried rice is a truly satisfying and incredibly delicious meal. Each food item is complementary to the others and this is a dish that is just so very enticing as it is served up hot. If you decide to cook this lamb with curried potatoes and fried rice dish, you will blow on your piping hot meal and barely allow it to cool before wanting to dig in! First off, roast lamb chops are something that I love to prepare and eat. As I mentioned in another one of my recent recipe hubs about cooking lamb, lamb is one of my favorite meats to eats. The other members of my family really enjoy eating lamb as well. When lamb is on the menu, we know that we are in for quite a treat! The fried rice that I prepare to go with the oven roasted lamb is a very simple and easy fried rice. 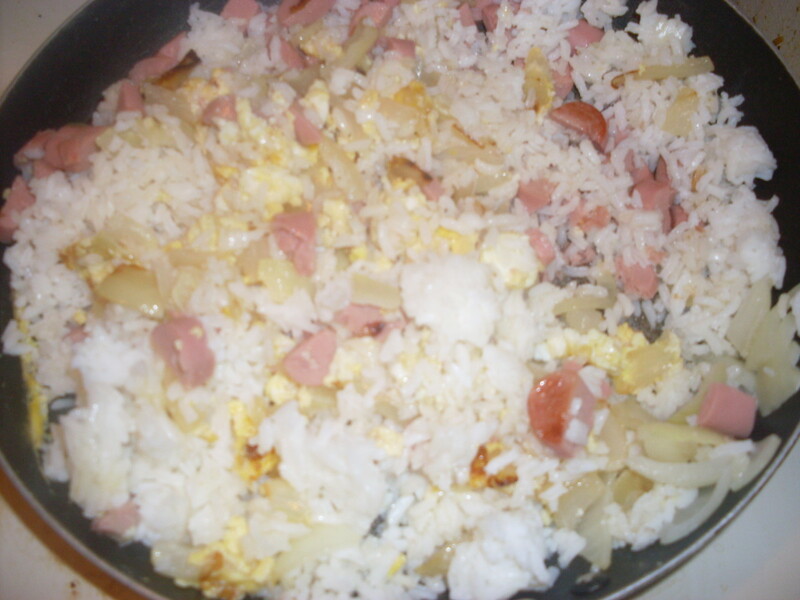 You can leave this fried rice meat less since you will already be having lamb as your meat or you can add a very inexpensive and easily prepared meat such as chopped hot dog or chopped Vienna sausages to the fried rice just for a little added flavor. The curried potatoes will be like the icing on the cake. These curried potatoes are so rich, creamy and flavorful that you might likely want to eat a second helping of them after the first. Another recent recipe hub that I wrote about a curried beef with potatoes dish illustrates that I love to cook curried potatoes. I do so quite often. For the potatoes, the delicious milky curry sauce has a rich yellow color. 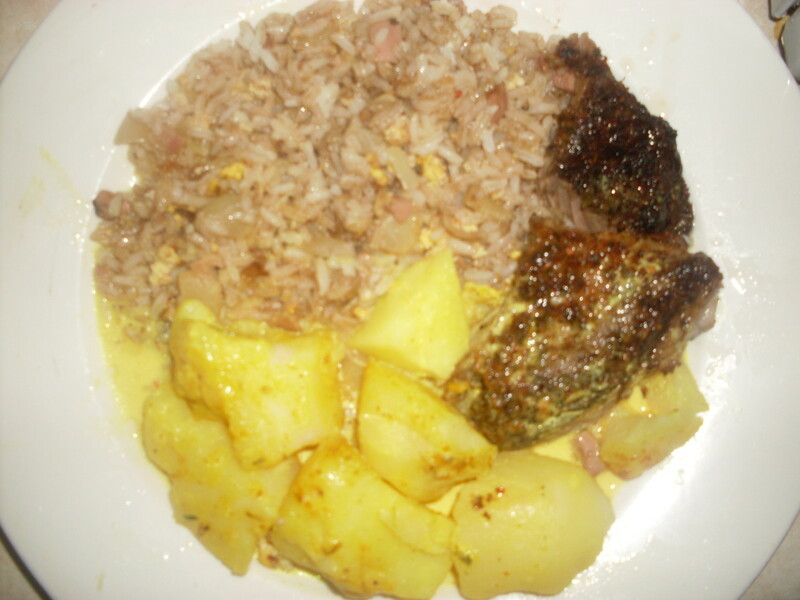 Preparing this lamb with fried rice and slow cooked curried potatoes meal is a little time consuming but the meal is really delicious. You won’t regret spending some time on the fantastic resulting meal that your family will savor. For example, for a family of four or five and for everyone to get their own nice sized portion of lamb chop as shown in the photo, you might want to purchase two small packages of raw lamb chop meat, each package containing just under two pounds of meat. Remove all of the plastic packaging from the lamb meat and wash and rinse the lamb meat well. Arrange the raw seasoned lamb chops on a foil lined baking tray that has been greased with canola oil, add 1-2 tablespoons of water around the lamb chops and place the baking tray containing the raw seasoned lamb chops in the oven. Roast the lamb chops in the oven at that 400 degrees setting for the first fifteen minutes and then reduces the heat to 350 degrees for the remainder of the time (and additional 1 hour and 15 minutes). Then turn off the oven, remove the baking tray with the lamb chops from the oven and cover the baking tray with foil. Set aside. Keeping the heat setting of the slow cooker on low, continue to let the potatoes cook and simmer in the curry sauce for one last hour. Then turn the slow cooker off. I would like to say again, “meanwhile” during the long intervals of time that you will have while the curried potatoes cook in the slow cooker, you could be preparing the fried rice on the stove top. and optionally chopped up fully cooked hot dog or Vienna sausage as I mentioned before and as is shown in the photo. 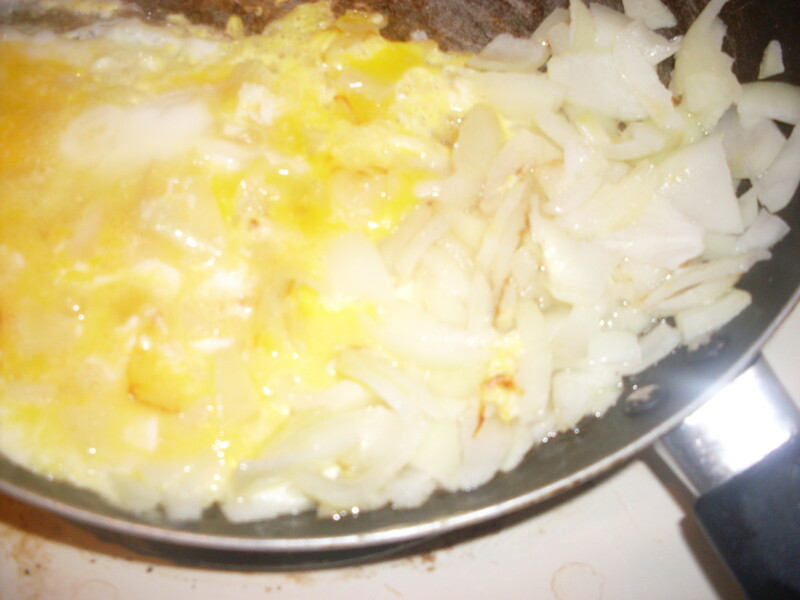 All in sections of the surface area of the same frying pan, the eggs can scramble, the onions can carmelize and brown and the rice and chopped hot dog can heat. Again, the 4 tablespoons of soy sauce should be added directly on top of the white jasmine rice. 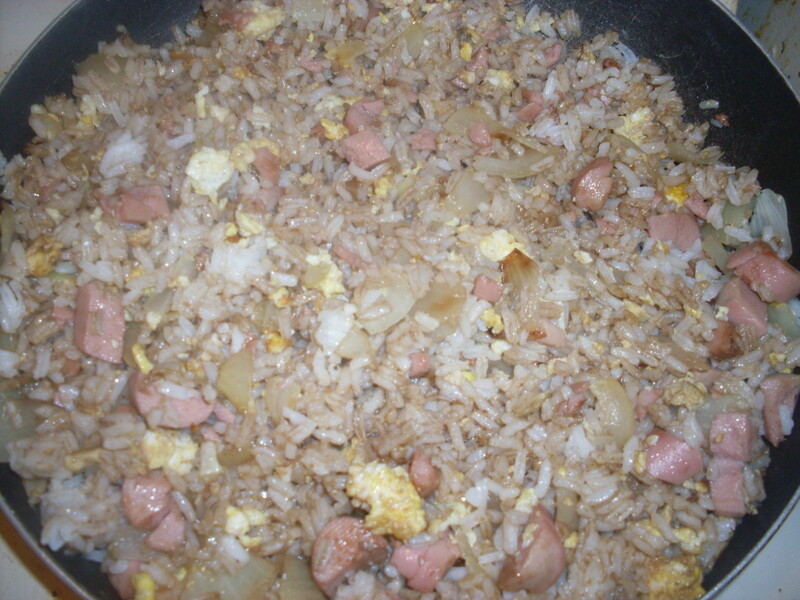 As the eggs develop a firm texture and are no longer raw, then you can start to stir and blend everything together (the soy sauce covered rice, the chopped onion, and the eggs, and chopped hot dog). As the enclosed photo illustrates, it will all become a very enticing blend that you will be ready to taste pretty soon. After the white rice has been fully cooked in a pot of boiling water, drained and transferred to the frying pan with the rest of the fried rice ingredients, the fried rice can be ready within just fifteen minutes of being on the stove top on medium setting. Lastly, with all of your items (roast lamb chops, slow cooked curried potatoes and fried rice) ready for serving, you can arrange them beautifully on plates for serving and enjoying! Is the curry dry or thick gravy?